In summer 2018, a guy we know took over the beach and restaurant on Şövalye Island – so Şövalye Adası Restaurant & Beach was born (‘ada’ means ‘island’). As is the polite thing to do in Turkey, when someone you know embarks on a new venture, you go along to show your support. 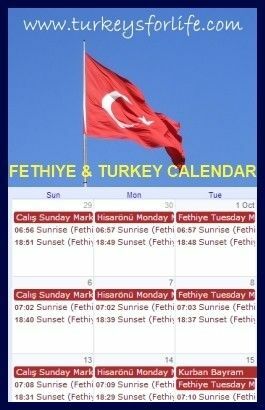 This is never difficult in Fethiye because most of the people we know open lovely bars, restaurants and beaches. Of course, these are the places we want to visit. Stand in Fethiye or along Çalış Beach and look out into the bay and you get the constantly changing view of Şövalye Island. We say ‘constantly changing’ because it seems you only need to walk a few metres and the shape of the island has completely changed. Long, stretching and low, viewed from most angles. The angle in the photo above, however, is completely different. The tip of the island, concealing the treats which lie in store for those who make the short hop over there. This is your view of Şövalye Island as you wait at the jetty for the beach restaurant’s complimentary boat service to come and pick you up and take you across the water. 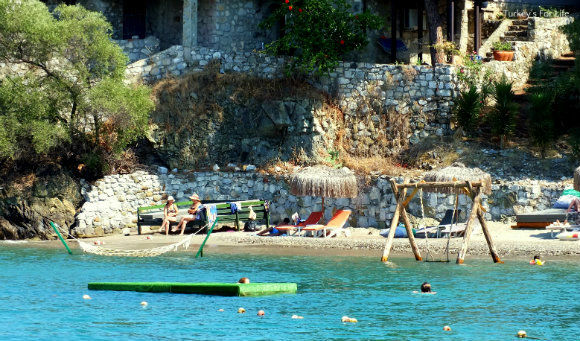 The boat jetty is at the end of Çalış Beach between the yöruk tents and Şat Restaurant. At first, we weren’t sure we were at the right place but, eventually, we could see a boat bobbing across the water in the distance and it was heading our way. As it pulled up alongside the jetty, we could see the green and orange sign for the beach and restaurant. This was the right one! The boat journey only takes about 5 minutes but you’re rewarded with sweeping views all along Çalış Beach. And then, as you approach Şövalye Island, it’s a case of gazing up at the villas clinging to the steep cliff face, motor boats and speed boats moored up at private jettys. This is the comfortable side of island life. Eventually, we arrived at our destination, passing the beach that is part of the restaurant and mooring up at the jetty. The beach at Şövalye Island is backed by mature trees which offer some natural shade. Further shade comes courtesy of the umbrellas. As we got off the boat, wooden signposts directed us to the different facilities. Toilets and showers to the right. Beach and beach bar to the left. Restaurant straight ahead, up the steps. And this very handy signpost, telling guests at Şovalye Adası Restaurant & Beach about the shuttle boat times. Well, let’s face it, we all need to go back to the mainland at some point. At the beach, people were sunbathing, swimming and making use of the ‘toys’ in the water. As with Aksazlar Beach, there’s a swing here where you can trail your feet through the water. And who said hammocks have to be on dry land? If you want to lie, semi-submerged in the Mediterranean but you don’t fancy floating around on your lilo, clamber into the hammock for a cool down. As with the beaches around Fethiye Peninsula like Help and JJ Beach Park, the sea at this part of Şövalye Island is quite calm and clear. A swim barrier marks a boundary for safe swimming – day trip boats and fishing boats regularly anchor around this part of Şövalye island – and there are jumping and diving platforms for those who like that sort of thing. Not for us, though. You know we’re not particularly beachy people. Actually, what we did when we got off the service boat was to head straight up to the Şövalye Adası Restaurant area. It’s long been a favourite place of ours for its seclusion and views. We were looking forward to reacquainting ourselves with them – and saying hello to the restaurant and beach’s new manager, of course. That was why we were at Şövalye Island, if you remember. Walking up to the restaurant; there’s always a lovely feeling of anticipation even though we’ve climbed those few steps many times before. You feel as if you’re walking into the trees, away from the sea. And then, all of a sudden, you’re at the dining area with dramatic sea views – views of the opposite side of Şövalye Island. The indoor part of Şövalye Adası Restaurant & Beach is to the right corner of this photo – the plan is to stay open year round – but for the summer months, we’re concerned with the outdoor space. And who could complain about a setting like this? And you can climb even higher, too. Şövlaye Adası Restaurant is blessed with a roof terrace on top of the indoor restaurant. The photo above is the view of part of the main outdoor area below and then along the west-facing side of the island. And you know what west-facing means, don’t you? From this roof terrace, you can witness a spectacular, uninterrupted sunset – and dine from the a la carte menu, too, at the same time. As tiny as Şövalye Island is (we are told the population is around 100 in summer and 10 in winter) its geographical setting means it has lots of different faces. From the restaurant roof terrace, you can see that gone are the calm waters of the sheltered beach area and in their place are sheer cliff faces and crashing waves as they break against the rocks below. Peaceful nature become has become powerful nature. Back at restaurant level – still with dramatic views but also shaded by trees and canopies and framed with bougainvillea and other shrubs – it’s all about colourful cushions. We love a cushioned tree seat and natural shade is always a bonus. And don’t be fooloed by the fact that we’re only a stone’s throw away from the Fethiye mainland here. To the left of this photo, we’re looking beyond red Island (Kızıl Adası) and out to open sea. On a hot, summer’s day, you can sit at the restaurant in the shade and feel the cool sea breezes as well as losing yourself in those magical views. It was blissful when we were there. In the daytime, you can dine from the snack menu that’s just packed with choice. When food time came, Barry went for the chicken burger and, after much deliberation, I plumped for the halloumi salad. The chicken burger was succulent breast in a spiced marinade. Served with chips, side salad and a spicy sauce (we couldn’t decipher the ingredients but it was a winner for us), it eventually defeated Barry and the chicken was removed from the remainder of the bun to be eaten as was. When the waiter came to collect our plates afterwards, he was concerned the burger wasn’t to Barry’s liking. Time to explain that no, it was really lovely. Just no more tummy space! As for me, I just love a halloumi salad – if there’s not too much going on with it. This salad suited me fine – three different types of salad leaves, including rocket; parsley, cherry tomatoes and marinated grated carrot in a light dressing. A mild mustard complemented the flavours perfectly. I also got a serving of pide bread with the salad…and helped myself to the chips Barry couldn’t finish. Waste not, want not. Anyway, we’re looking forward to trying more of the menu in the future. Our first visit to Şövalye Adası Restaurant And Beach was a wander; a trip to an island and a restaurant that we’ve not visited for a good few years. With the current set up, however (easy boat access), we can get there whenever we like with minimal planning. We like a beachy foodie day out with minimal planning! After a cold beer, rather than hitting the beach, we decided to go for a little wander around Şövalye Island. From the restaurant, you can walk straight up the main pathway that guides you around the perimeter of the island. All perfectly peaceful because Şövalye doesn’t have cars! Wonderful. And look at those stunning views back to Şövalye Adası Restaurant as you start your little walk. As you follow the pathway, the only sounds are the crashing of waves. Or snippets of overheard conversations from people’s balconies and terraces. Fishing boats and speed boats…oh, okay, and the odd bit of building noise from the villas that are being renovated. A little dose of real life doesn’t do any harm, though. Eventually, we rounded the tip of the island and another face was revealed. This time, we have the calm waters of the bay of Fethiye. We’re overlooking the town and being watched over by Babadağ, across the water. Beyond the jettys, the bungalows of Letoonia all inclusive hotel can just be seen, peeping through the trees. It’s a super slow pace of life on Şövalye Island. Not a bad setting for a hammock, is it? Gardens, both new and mature, decorate your route around the short pathway. And, naturally, the sea views are constant. They just change a lot. From one angle, we could make out the observation deck in Fethi Bey Park in the distance. Some villa owners on Şövalye Island have built or renovated with an ultra modern look. Others have gone for a rustic, traditional feel. I couldn’t resist taking a photo of this entrance to a walled garden around one villa. What a lovely doorway, this is! Eventually, you’ll see a wide dusty track, too. Don’t ignore this as this track can take you full circle back to the beach and restaurant with little treats of ruins from the Byzantine era. It also happens to pass the rear of Şövalye Hotel; a hotel that a reader had told us to take a nosy at as they love the place. The owner was in the garden so he came over and offered to show us around. Well, you’re not going to say no, are you? And as balcony views go, these are not too bad are they? We could see why our reader had recommended we drop by Şövalye Hotel and it was lucky that we just happened upon it as we were exploring. Time came to to head to the restaurant once more. Time for one more drink – these little explorations are sunny, thirsty work – before the boat we wanted to catch was leaving. We continued to follow the wide, forested track, passing ruins en route. A few minutes later, we could hear the splashes, laughs and calls of swimmers and sunbathers down below us on the beach. We again headed to the restaurant area and ordered a cold beer. As we sipped, we made our pledges to return to Şövalye Adası Restaurant & Beach very soon. We said our farewells to the new owners and headed down the slope, back to the beach and the boat jetty. Day trip boats were anchored for their final stop of the day. As we turned around to look back at the Şövalye beach, the sun glinted on the water and the sheltered bay became a silhouette. 5 minutes later, we were back at the jetty on Çalış Beach. Just another feather for Fethiye’s feather-stuffed cap. We can spend the day on an island and be back on the mainland within a few minutes! Think we’ll be back there soon, too! To get to the restaurant and beach, there is an hourly complimentary boat service starting at 9am. The boat is for beach and restaurant guests and takes about 5 minutes. Look out for the green and orange ‘Şövalye Adası’ sign on the front of the boat. The boat picks up and drops off at the long jetty between the yörük tents and Şat Restaurant. This is the far end of Çalış Beach at the Fethiye side. If you’re not familiar with Çalış Beach, take a left when you enter and keep walking until you see the Şat entrance gates. The jetty is just there. Entrance to the Şövalye beach and restaurant is free. Parasols and beds (summer 2018) are 10TL per bed and 10TL for a parasol. Prices are not super cheap (this is island drinking and dining) but neither are they ridiculously expensive. We think they’re fair for the setting. A beer is 22 TL (summer 2018). A cheese burger, for example, is 28 TL. At the time of writing, Şövalye Adası Restaurant & Beach is a brand new business and the aim is to be open all year. They also hope to introduce more transfer services from other areas in the future. There is a snack menu for daytimes (with breakfast choices, too) and also a full a la carte menufor evenings. For more pics and info, you can follow Şövalye Adası Restaurant & Beach on Instagram and on Facebook. If you fancy a romantic overnight stay (or longer) on the island, there are some hotels and villas listed on Booking.com. And, of course, there are plenty more beautiful beaches in the Fethiye area. Another enticing account of a trip from Fethiye which makes me want to follow in your footsteps. Thanks very much! Roll on your food update! Yep, your jaunts become my jaunts, haha! The times are on the photo in the post. We have linked to the Şövalye Adası Restaurant and Beach Facebook page at the bottom of this post. You cna message them on there or their phone number is on there, too.